A farce from the 17th century, Tartuffe employs witty rhyming couplets and classic characters in a sendup of society’s hypocrisies and privileges. Equally resonant for today’s audiences, the play shows the con man Tartuffe taking over a household right under the patriarch’s nose—unless reason prevails and the family can expose him. Check out a feature on the show by DC Theatre Scene. Performances: January 25, 26, 27, and February 2 and 3 at 8 pm; January 28 and February 4 at 2 pm. Special “Spotlight on Tartuffe” salon and audience discussion following the January 28 matinee, led by Ashleigh Corwin of Georgetown University, a PhD candidate in early modern French history, with a focus on sixteenth-century religion and politics. Bridget Grace Sheaff will direct this classic comedy by Moliere. 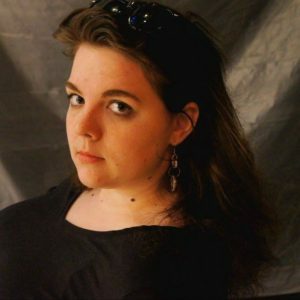 D.C. area directing credits include Nu Sass Productions: Exit Carolyn; We Happy Few Productions: The Dog in the Manger, Cyrano de Bergerac, A Midnight Dreary, Iphigenia; Spooky Action Theatre: Motherless Children; Source Festival: Static, The Physics of Now, Ball Drop; and Mead Theatre Lab: One Word More. Regional credits include Cape May Stage:Merry Melodies and Savage in Limbo. Assistant directing credits include Constellation Theatre: The Wild Party; Signature Theatre: Titanic; Spooky Action Theatre: Collaborators; Theater J: Sons of the Prophet; and Rorschach Theatre: very still & hard to see. Bridget Grace is the Casting Director/Associate Producer with We Happy Few Productions and has a BA from The Catholic University of America. Lizzi Albert directed a reading of the Steven Dietz docudrama God’s Country at the Trinidad Theatre—Logan Fringe Arts Space on Tuesday, November 14 at 7:30 p.m.
First performed in 1988, the play explores the white supremacist movement in America through the trial of a paramilitary group for the murder of a Jewish talk radio host. Dietz lays bare the subculture of hate that many of us would have liked to think represent only a few individuals on the fringes of society, and it is eerie and disturbing how contemporary this play seems 30 years later. This reading benefited the work of the Southern Poverty Law Center, which works to track, expose and litigate against hate groups as part of its mission. One reason we chose this organization is for its resources for the average person asking “What can I do?” and “How do I respond to these events in my community?” A representative of the SPLC spoke about their work at the organization and answered questions from the audience. Cast: Matthew Ancarrow, Michael Crowley, Kevin Dykstra, Emily Gilson, Willem Krumich, Yury Lomakin, Matt Sparacino, Sue Struve, and Emily Sucher. 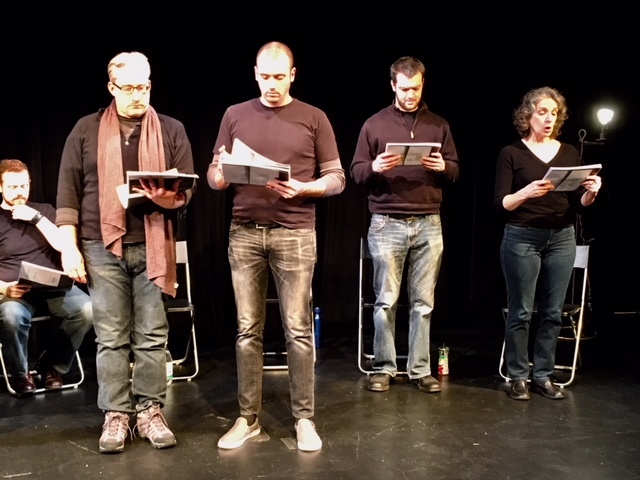 Actors perform in a reading of “God’s Country” by Steven Dietz, at Capital Fringe.